You cannot go wrong with this recipe! The sweet combination from the pears mixed with the onion and celery is absolutely amazing! Trim away fat and cut a pocket into each chop. Combine flour, salt, and pepper on a plate and dredge chops in flour mixture. Sear chops to brown in a skillet sprayed with cooking oil, about 5 minutes on each side. Add some water to pan to deglaze and pull up any brown bits. 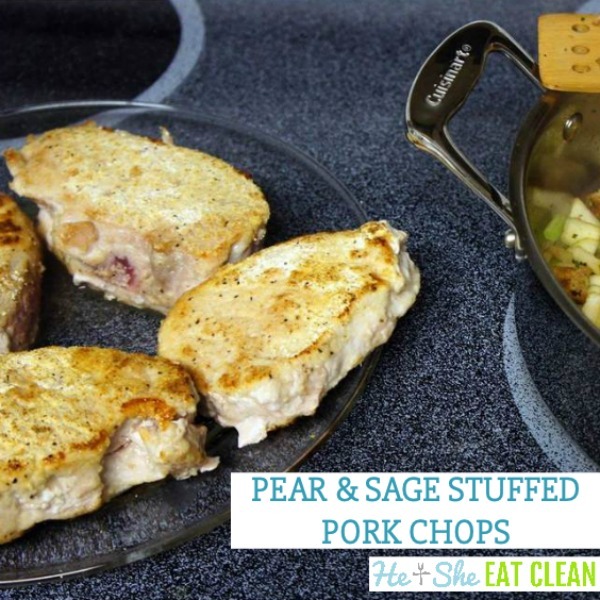 Remove chops from the pan and set aside. Add oil to the pan and saute onion and celery. Add bread cubes, pear, sage and rosemary. Moisten with 2 tablespoons of water or more if needed. Stuff chops with cooked mixture. Place a toothpick in each cop to hold together. Place in a baking dish coated with cooking spray. Pour any residual liquid over chops, cover and bake at 350 degrees F for 30 minutes, until center is no longer pink and internal temperature reaches 145 degrees F. Serve.